Q: How can I add music from my Spotify account to my tomtom watch? how do i put Spotify music on the tomtom spark watch? TomTom Spark users asked on TomTom discussions center. If you are also looking for a way to play music from Spotify on TomTom Spark, read on this article and we will provides details on how to enjoy Spotify music and playlist on your TomTom Spark easily. TomTom Spark is a GPS running watch with heart rate monitoring and daily activity tracking. There's also a built-in music player, with storage for up to 500 songs gives you all the musical motivation you need while working out. You can enjoy music on your TomTom GPS watch freely without having to strap your mobiles during exercise. You can simply import music from iTunes and Windows Media Player to start listening to music on TomTom Spark. TomTom Spark cannot legally play music from Spotify. For one thing, Spotify is a music streaming service. You'll need a phone, laptop or tablet with the latest Spotify app to play the music. The watch has no OS to launch the Spotify app. Spotify also does not license their service to any sports watches. On the other hand, TomTom Spark supports MP3 and AAC audio formats, while Spotify music offers the DRM encrypted Ogg Vorbis format. Owing to DRM protection, you can't transfer any content from Spotify client to other devices, TomTom Spark included. So is there any way to play Spotify Music on TomTom Spark? The problem can be solved easily thanks to the development of the third-party Spotify Audio Converter. And among them, TunePat Spotify Converter is the most outstanding. With built-in innovative DRM decryption technology, TunePat can remove DRM protection from Spotify songs. It is also an all-in-one Spotify Audio Converter, which enables you to convert Spotify tracks, playlists and albums to TomTom Spark compatible files, no matter you are a Free or Premium user. 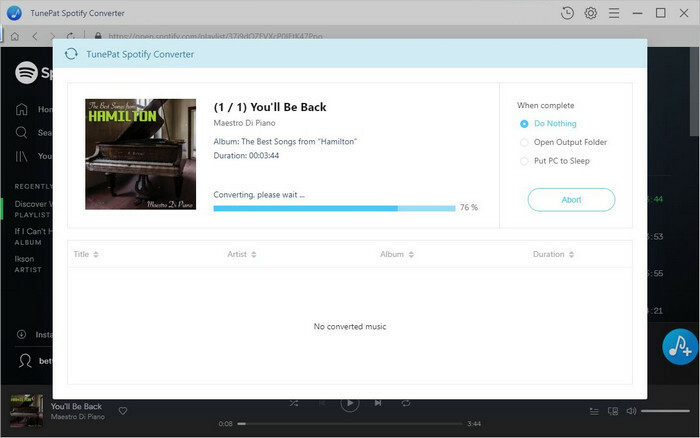 Even if you don't install Spotify application on your computer, you can also use TunePat to finish the conversion process with up to 10X speed. Now, you can follow the complete tutorial below to convert Spotify Music to plain audio formats so that you can add them to TomTom Spark for playback. 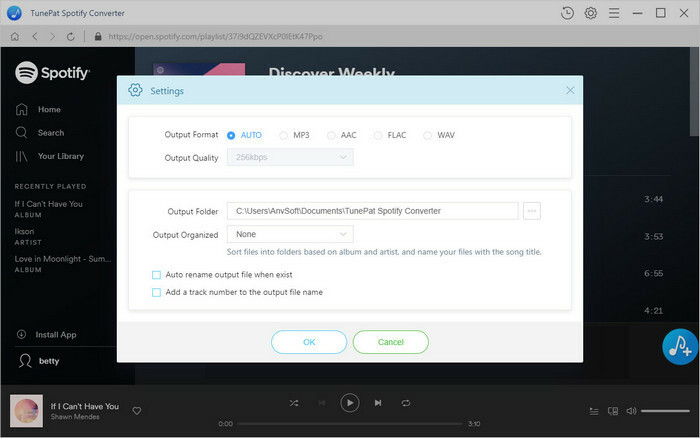 Firstly, download and install the latest version of TunePat Spotify Converter on your computer. 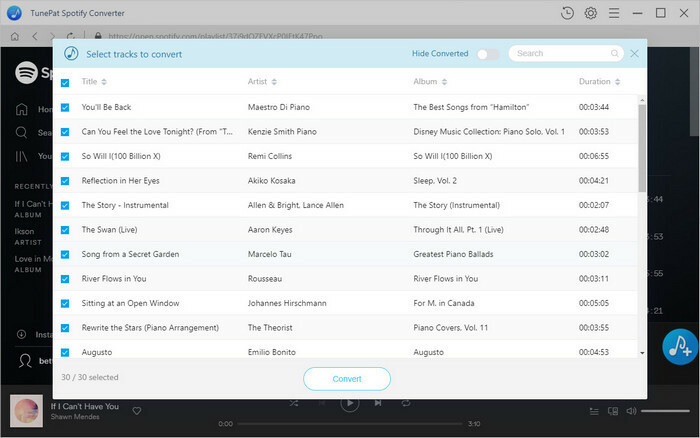 TunePat Spotify Converter is fully compatible with Windows and Mac. You can choose to download according to the os you own. Step 1. Set MP3 or AAC as output format. Launch TunePat on your computer, click button on the lower right-hand corner of the interface, you will see the Settings window pop-up. Then you can choose the output format, we suggest you choose MP3 or AAC as the output format. Step 2. Add Spotify Songs or Playlists to TunePat. Step 3. Start to Convert Spotify Music. Now you can start to convert Spotify songs by clicking the Convert button. After conversion, you can find the converted Spotify songs in the history folder. 1. As TomTom Spark supports syncing your music tracks directly from your computer files (via iTunes or Windows Media Player). So you can build new individual files organized into iTunes or Windows Media Player playlists, and then import the converted Spotify songs to the folder. 2. Connect your music watch to your computer. When you connect the watch, it will automatically scan for music. 3. Clicking the music icon will take you to the Music page which will show the playlists you have on Windows Media Player/iTunes and on the watch. You can then copy playlists to the TomTom Spark by clicking the + button. 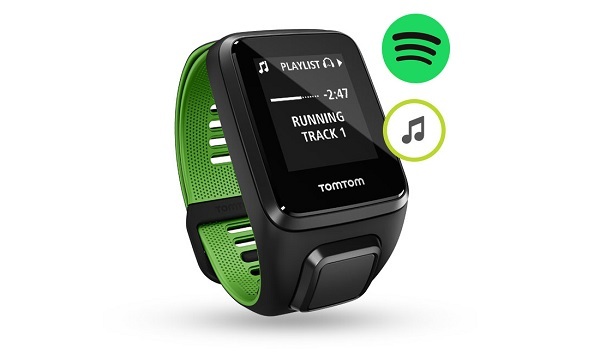 Once all of the converted Spotify tracks have synced to your watch, you can play Spotify Music or Playlists on your TomTom Spark.